Gun and/or gun owner registration is bad for a free society. In this article I will discuss briefly a bit of the ancient history of weapons prohibition. I will look at the 20th century's horrors of gun registration, confiscation, and subsequent genocides. Imprisoned 127,000 Americans of Japanese ancestry during WW II. 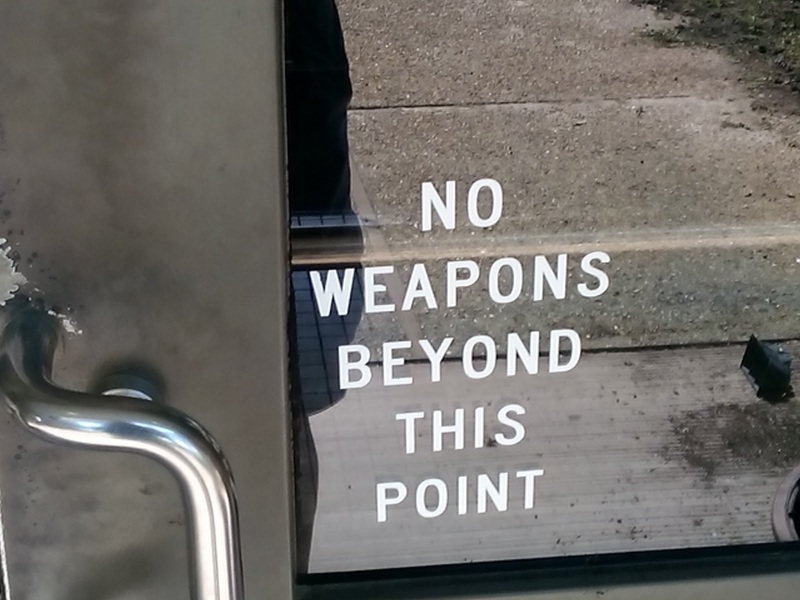 In this article I will discuss gun free zones, and look at the reasoning behind creating them. I will also discuss the futility of these, and point out a more logical alternative. For whatever reason, some people have the notion that posting a sign will cause universal obedience. 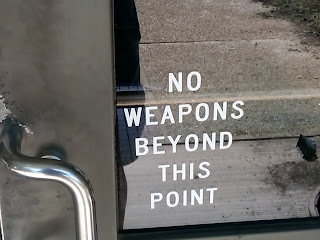 The sign may be in the form of a sticker on a door, or to stretch the point, an order of protection. These areas would more appropriately be called gun ban zones, because, as current events tell us over and over, they are not always gun free. Yesterday, Donald Trump threw his hat into the presedential ring. Below is a reprint of my Examiner column from April 12. Has the Donald totally looked into it? What do you think? Will Donald Trump run? Will he be the one to tell the current occupant of the White House, "You're Fired!"? And what does The Donald think about your Right to Keep and Bear Arms (RKBA)? With the 2016 presidential election looming on the horizon, a group of potential contenders gathered here in Tennessee and addressed NRA members on Friday, April 10. Like the others, Trump appeared to be sincerely concerned about the state and direction of our country. While lovers of liberty share their concern, it seemed prudent to get a statement from Trump relating to the Second Amendment. So, this column posed a question related to National Reciprocity, "As president, would you use that position as a bully pulpit to support National Reciprocity, so that, not only New Yorkers, but other people who come to New York, would be able to defend themselves?" Promptly jump into the pit to rescue your child? Most rational people would immediately act to rescue their loved one from this or any other danger. Retrieve your handgun and attempt to rescue your friend? a friend of the clerk saw the robbery in progress from the parking lot, got his own gun and walked inside the store. . . and fired once. If the store clerk would have killed him I would have felt different. But because that man came into the store and killed him as he watched this robbery go on...he was not in danger. He could have dialed 911 and then went in to the store. But he didn't, he just automatically went into the store and shot my son in the head. More and more Tennesseans (and Americans in general) are recongnizing that the police can't and shouldn't be everywhere. They are choosing to arm themselves against potential criminals. Tennessee Code Annotated 39-17-1322. Defenses. A person shall not be charged with or convicted of a violation under this part if the person possessed, displayed or employed a handgun in justifiable self-defense or in justifiable defense of another during the commission of a crime in which that person or the other person defended was a victim. So, this law would apparently cover the shooter, even if he had the gun on his person and did not have a permit. As to the armed robber, #interredisdeterred. Given this situation, what would you do? See Dave Workman's commentary at Examiner HERE. Capital punishment has been society's means of dealing with particularly heinous crimes since antiquity. In recent decades, the Left has told us that capital punishment is not a deterrent. They are correct, in that they have the courts rigged such that there is much too long a time lapse between the crime and the final adjudication of the case. By the time the condemned criminal is finally executed (if ever), so much time has passed that most people won't even remember the details of the crime. Even Timothy McVeigh, who detonated a truck bomb in front of the Alfred P. Murrah Federal Building in Oklahoma City on April 19, 1995, was not executed until June 11, 2001, six years later. Lately, not only is the death penalty virtually meaningless, but punishment for lesser, yet still serious, crimes has morphed from hard labor in the pen to a sport-fishing catch and release program. Police officers make the collar. Then, between bail and early release, the perp is back on the street in a short time. And while he was in the slammer, he had all his health care needs taken care of by the taxpayers. We have heard recently of the two convicted killers who escaped from prison in New York. Two decades ago, Tennessee passed a "shall-issue" handgun carry law, requiring the Tennessee Department of Safety to issue a handgun carry permit to any citizen who takes the required training, has a clean record, is mentally competent, and has enough money to pay for the privilege. Thirty-six states have passed similar laws. The legislatures and governors of these states have recognized that the typical crime does not occur when the police are nearby. Most crimes occur outside the home. Police most often can only clean up after the crime, take a report and start looking for the perpetrator. While the permitting process in Tennessee and other states has certainly improved the situation for citizens, it still places an undue burden on the peaceful citizen, but not on the criminal. In Vermont, it is lawful to carry a firearm openly or concealed provided the firearm is not carried with the intent or avowed purpose of injuring a fellow man. No permit is needed. In Vermont, citizens are not required to get a permit to carry a firearm. The State of Vermont has long recognized the right of its good citizens to defend themselves while away from home without the need of a permit. In 2014, Tennessee joined most of the states surrounding us, and does do not require a permit to carry a firearm loaded in a vehicle, but require a permit if one is to carry a handgun on or about the person.